FORT LAUDERDALE, Fla. – On the same day it made its first appearance in the Sunshine State Conference Tournament final, the No. 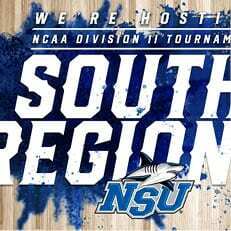 3 Nova Southeastern men’s basketball team (26-3) continued its historical season after being selected to its first-ever NCAA Tournament. Not only did the Sharks make the field of 64, but were also chosen on Sunday night as one of eight No. 1 seeds, and as such, will host the NCAA South Region Tournament in the 2019 NCAA Division II Men’s Basketball Championship. The Sharks will face No. 8 seed Miles (21-8) on Saturday, Mar. 16, at 5 p.m ET. at the Rick Case Arena. The two teams have never met before. 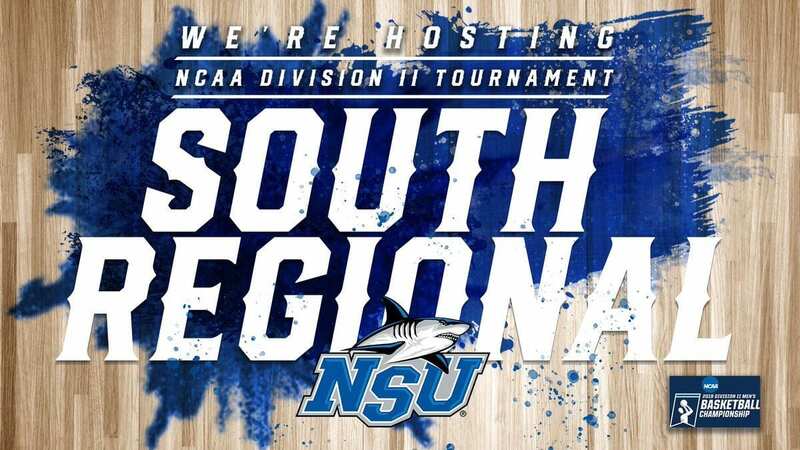 In all, the NSU campus will play host to seven games between Saturday and Tuesday: all four regional quarterfinal contests on Saturday, two second-round matchups on Sunday, Mar. 17, and the NCAA South Region Championship on Tuesday, Mar. 19. The winner will advance to the Elite Eight, the national quarterfinal round for the winners of each of NCAA Division II’s eight regions, which will be held at the Ford Center in Evansville, Ind., beginning Mar. 27 and concluding with the National Championship game on Mar. 30. Game 1: No. 3 Lynn (23-6) vs. No. 6 Alabama-Huntsville (24-7), 12 p.m.
Game 2: No. 2 Florida Southern (24-7) vs. No. 7 Delta State (19-11), 2:30 p.m.
Game 3: No. 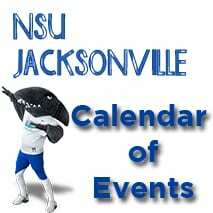 1 Nova Southeastern (26-3) vs. No. 8 Miles (21-8), 5 p.m.
Game 4: No. 4 Valdosta State (24-6) vs. No. 5 West Alabama (22-7), 7:30 p.m.
Game 5: Winner of Game 1 vs. Winner of Game 2, 5:00 p.m.
Game 6: Winner of Game 3 vs. Winner of Game 4, 7:30 p.m. Winner of Game 5 vs. Winner of Game 6, 7 p.m.